It hasn’t been easy but it’s been worth the struggle. Sometimes it sucked. Sometimes it was hard. But it was always worth it. Ten years ago today it all began. A journey for which I’ll always be grateful. I adopted Risa today back in 2006. A decade of time spent together. So much has changed. She’s not quite the fearful, dog reactive dog I brought home that day. I’m not the naive dog owner I once was either. We’ve been through a lot together. Not just training-wise. Not just in regards to her various behavioral and medical problems but in terms of life. She was my key to meeting new people when I was 2,000 miles away from home at my first real job. She was with me through two lay-offs and a lengthy unemployment. We moved across the country and lived in three states together. Our time together has been pretty much my entire adult life; my one constant through it all. Our bond has been forged through trying times and I think that’s what’s made it so strong. I’d never owned a dog before let alone one with so many issues. I had to figure out how to communicate with my new housemate, give her what she needed, and earn her trust. There was so much to learn for someone who thought she knew it all already. 😉 Risa opened my eyes to so many things from raw feeding to homecooked canine diets. Positive reinforcement training, canine freestyle, dog sports in general, and holistic medicine. I also learned more than I ever thought I needed to know about gastrointestinal problems, cancer, dog reactivity, and intervertebral disc disease. She has always been a spectacular teacher and continues to do so even now. The knowledge I’ve gained from living with her I’ve shared to help several foster dogs and plenty more of my dog training students! It’s hard to believe sometimes she’s still that dog I brought home so long ago. Back then, so few people knew the real Risa. She was never comfortable enough to open up and be herself (have I mentioned before we’re very similar?). Only I knew who she really was. Silly, fun-loving, crazy goofball. Even with her back injury and her increasing age she is still that same dog. Maybe not as fast and agile as she once was but just as nuts and ready to have a good time. 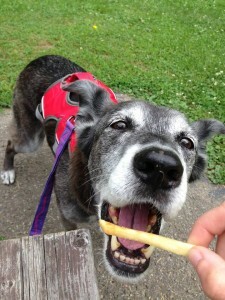 Happily consuming once of her favorite treats: McDonalds fries. I took her on a road trip to celebrate last weekend. We couldn’t have had a nicer day. It was cool with intermittent rain showers but perfect Risa weather. She can no longer tolerate the heat like she used to so a day in a high 60s to low 70s was ideal. I treated her to McDonald’s french fries (her all-time favorite) and even shared a bit of my burger at one of her favorite parks. There is a river there that she is absolutely obsessed with so I thought that would a great place to go. Especially since there are few waterways around here in which she can splash around and have fun. I let her go in the water as many times as she wanted. 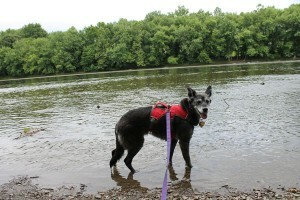 It was a bit tough for her to navigate the rocky bottom with her back problem but she still had a blast. She grabbed sticks and sniffed around. She got wet and happy. It was even cool enough for her to go for a relatively long walk without overheating or getting tired. We spent about 4 hours at the park just hanging out together. Just me and my dog. She’s earned it. Today we celebrated again with ice cream. I bought her some vanilla soft serve and I indulged on a brownie sundae. I also had to eat about 2/3rds of her ice cream since that much dairy would have sent her gut reeling. Neither one of us wants to have to deal with that! I want her to be happy; not get sick. 😉 She inhaled her sweet treat. She’s 12.5 years old now and I can’t help but be constantly reminded of how much she has aged. Especially this year. Her back injury has made it more and more evident that she is not the dog she once was physically. She’s still holding up great, however, and the spark is still there. I’m so happy she still wants to go and do things. Take long walks (not as long as she once did) and train together. Compete in sports and play and be silly. Despite her back, she’s still in good health. I’m thankful for every day I have with her. She’s a one-in-a-million dog and I’m so very grateful the shelter was willing to let me adopt her. She’s been one of the best decisions I ever made. This river is my happy place! 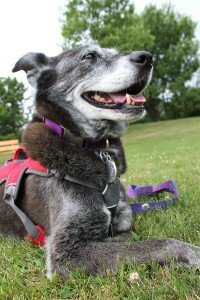 This entry was posted in Dog Sports, Fear, Reactivity, Thoughts, Training, Veterinarian. Bookmark the permalink.